Our next legend of the century is Jaye Bowden, who last weekend joined Peter Hudson in Glenorchy's exclusive 500-goal club with a six-goal haul against Clarence. We caught up with Jaye before the game to catch his thoughts about the milestone, his career at KGV and his club's 100-year celebration. It was always going to be a day to remember for Jaye Bowden, and the Glenorchy boys made sure it’s one he’ll never forget with a 62-point demolition of the old enemy, Clarence. 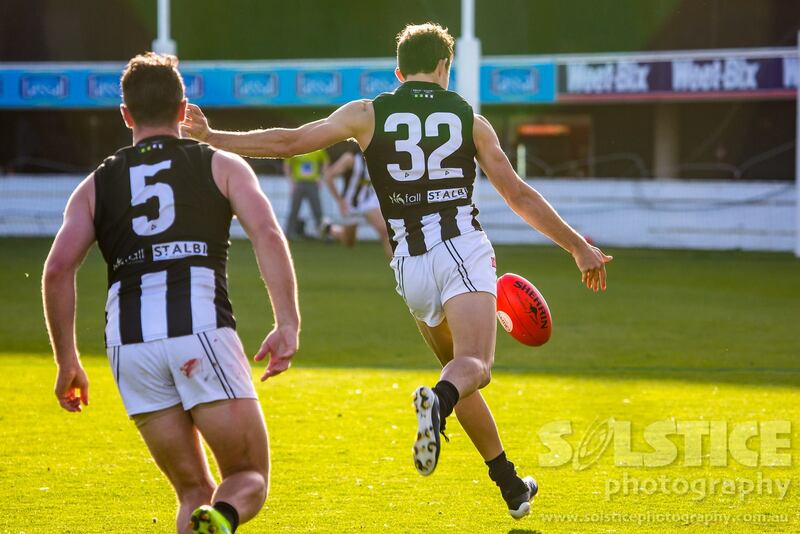 Bowden became the second member of the Magpies’ 500-goal club just two minutes into the game, joining the legendary Peter Hudson thanks to an off-the-ball cut lunch from Roo Chris Nield. Bowden was awarded a free kick, calmly slotted the easiest of set shots and was mobbed by his teammates, before reaching deep into his bag of tricks minutes later for a classic snap from the boundary. A superb first-quarter burst has propelled Glenorchy to a comprehensive 41-point win over its oldest rivals North Hobart in Saturday’s Heritage Game at KGV, which saw the green and gold jumper of New Town's early years return to state football. A packed Heritage Dinner had heard from old Magpies-Demons rivals Gary Linton and Darryn Perry, and with one of the biggest KGV crowds in many years filing through the gates, the home side put on an early show to befit the occasion. It was a physical start with numerous skirmishes in the opening minutes, but some Josh Arnold-triggered ball movement through the corridor ended with Aiden Grace five metres out and the Magpies were on the board. It was a grind but the Pies didn't mind, running out convincing 29-point winners over Launceston on Saturday to open the Centennial Season. Kicking with the Windsor Park wind in the opening term, the Glenorchy boys squandered their dominance around the ground. However, an electric crumbers' goal by Cal Daly and Aiden Grace's first major in the black and white ensured the visitors took an eight-point lead into quarter-time to get some return for their efforts. 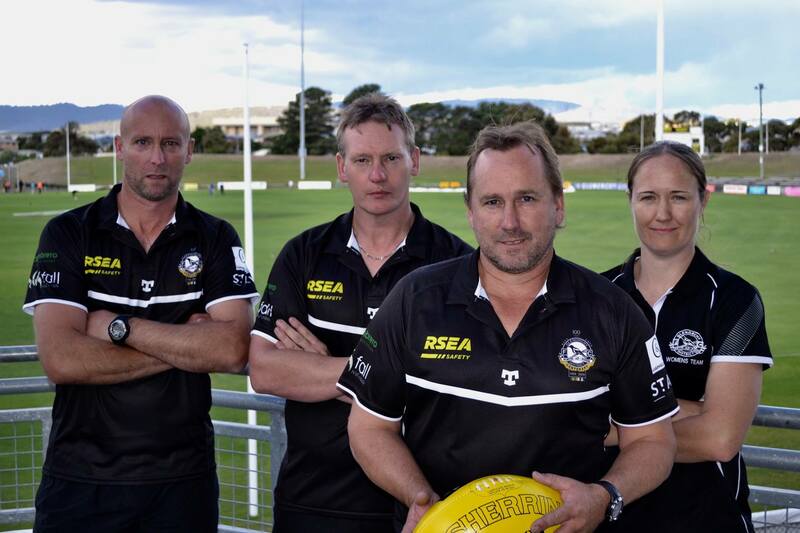 The Glenorchy District Football Club is proud to announce Peter Barwick as TSLW Senior Coach for the 2019 season, taking the reins from premiership coach Craig Grace. “It’s a great honour to head up the panel as senior coach in the club's Centennial Year. It’s also a privilege and a challenge to take over from Craig, who has done an amazing job, not only for the Glenorchy Football Club, but for women’s football in general." Peter will head up a Coaching Panel of (from left to right) Garry Barwick (midfield coach), Dean Webster (backs coach) and Sandy Eaton (forwards coach). In a first for the club, the team’s opening game will be on ANZAC Day under lights at KGV, including the unfurling of the 2018 Premiership Flag. The Glenorchy District Football Club celebrates 100 wonderful years in 2019 and we invite you to join us for 2 very special events on our Centennial weekend. On Friday 31 May, enjoy the best seat in the house as Glenorchy host arch-rival Clarence under lights in our 'Centennial Game'. Members of the 1999 TSL premiership team will be in attendance along with special guests. Price is $40 per person, or a table of 10 for $300 and includes a ‘pub-style’ meal from Waji Food, game viewing from the magnificent Jack Rough Room and ground entry. The function starts at 6.00pm, with the GDFC Women’s team playing Clarence at 5.30pm with the big game between Glenorchy and Clarence starting at 7.30pm. Saturday morning our Development League kick off against Clarence at 11.30, while our Under 18s play at 9.30am. Kiosk will be open along with the Magpie Bar. On Saturday evening, 1 June the celebrations continue with our Centennial Dinner at Wrest Point Casino. Club legends, live entertainment, wonderful memories and guests such as Peter Hudson, Rodney Eade and many more. Cost is $155 (inc GST) for Adults, $130 for GDFC Members, $110 for GDFC Concession Members and $1350 for a table of 10. Sunday, 2 June will be a final chance to catch up with members, supporters and friends with a family day at KGV. 2019 is a great and historic year for our proud club. I look forward to seeing you to help us celebrate. The Glenorchy Football Club is proud to announce that 2019 Memberships are now available. We have a very special Adult Membership that includes a limited edition NTFC/GDFC Centennial badge along with a 9 home game pass. There is also a Centennial Family Membership, Concession and a new addition with the Social Family Membership. Great value for families and supporters and includes free entry to our 2 family games at KGV and a GDFC mini-footy! Click here to purchase your Centennial Memberships online, or they can be purchased at the club offices, Magpie Bar or via direct deposit. The Glenorchy District Football Club is very proud to unveil our new centennial logo for 2019. The club was originally founded as the New Town Football Club in 1919, and was located at New Town Oval. In 1957 the club merged with the Glenorchy Rovers was renamed the Glenorchy District Football Club and relocated to KGV, which is now known as the spiritual 'Home of the Magpies'. Our new logo encompasses the original colours of New Town along with the now famous black and white. Our Senior Teams have won 19 Premierships from our first in 1919 to our last 2016. Our Womens Team have won 1 Premiership in 2018. 1878……New Town Football Club founded. 1879……New Town Football Club commenced competition in the newly formed Tasmanian Football Association. 1887……New Town amalgamated with Glenorchy Football Club to form the Victoria Football Club that played in a Junior competition. 1905……New Town had reformed under its original name to compete in the Southern Tasmanian Football Association until it became defunct in 1907. 1919……A group of enthusiastic football supporters came together in late 1918 to reform the New Town Football Club. The Club competed in a local junior competition during the early part of the 1919 season before joining the newly formed Southern Tasmanian Junior Football Association. 1921……New Town Football Club joined the senior competition, namely the Tasmanian Football League. 1942–1944……The Tasmanian Football League went into recess following the outbreak of the 2nd World War and resumed in 1945. 1945……The Tasmanian Football League resumed competition under the banner of a District Boundary system. Clubs in the competition adopted the word District to their respective names, hence the : New Town District Football Club. 1957……New Town changed its name to Glenorchy District Football Club and moved from its New Town oval to King George Fifth oval at Glenorchy. 1957……Glenorchy FC merged with New Town, forming the new Glenorchy District FC. 2017……Glenorchy women's team joined the Tasmania State League Womans's league.